Winner. Small Feet, Big Land: Adventure, Home and Family on the Edge of Alaska. By Erin McKittrick. Mountaineers Books, Seattle. ISBN 9781594857362. 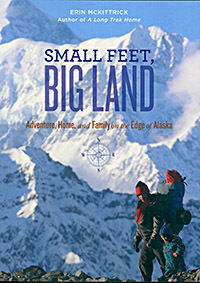 Small Feet, Big Land is a beautifully rendered meditation of family, friendship, and the Alaskan outdoors. Erin McKittrick, her husband Hig, and their two children live in a 450-square foot yurt near Seldovia in Southcentral Alaska. No strangers to the rigors of wild country, McKittrick and Hig had previously set out on a remarkable journey on foot along the rugged Pacific Northwest coast, starting in Seattle and ending at the Aleutian Islands, the later stages of which she was pregnant with her first child. It was a journey with an uncertain outcome, but they made it, all 4,000 miles. In Small Feet, Big Land the couple is still undertaking adventures but this time with a toddler and a newborn baby in tow. They explore wilderness terrain, visit remote Arctic villages, and live for two months atop one of the world’s largest glaciers. It is quite simply what exceptional outdoor literature is all about: an honest, perceptive, and graceful account of life close to nature. Winner. 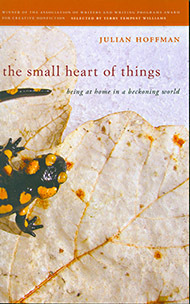 The Small Heart of Things: Being at Home in a Beckoning World. By Julian Hoffman. The University of Georgia Press, Athens. ISBN 9780820347578. In this elegant celebration of nature and place, Julian Hoffman focuses on his home country: the Prespa Lake area that straddles the borders of Greece, Albania and the former Yugoslav Republic of Macedonia. It’s an area little known to most readers, but Hoffman very quickly puts us at ease, describing the natural surroundings in a way which is comforting and familiar. He also celebrates the human element of his surroundings—the warmth and generosity of the local people—who in combination with the natural environment make the Prespa Lake countryside special to him. It is the small things that capture Hoffman’s attention, and through the simple power of his writing, they attract us as well. It may be a caterpillar carrying its house of leaves, shepherds ranging high mountain pastures, or a quail taking cover in an empty steppe. He very capably knits together these and other reflections into a coherent and captivating treatment, an ode, in essence, to the small things which bind us to the places that mean the most in our lives. Winner. 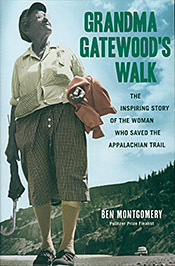 Grandma Gatewood’s Walk: The Inspiring Story of the Woman Who Saved the Appalachian Trail. By Ben Montgomery. Chicago Review Press, Chicago ISBN 9781613747186. What’s this? A book about the Appalachian Trail? But who is this grandmotherly looking woman pictured on the cover, holding an umbrella and dressed in a checked skirt, print blouse and baggy hose? Surely, this is not the picture of someone backpacking the Appalachian Trail? Indeed, it is! Meet Emma Gatewood. She’s the first woman to hike the entire Appalachian Trail, and the first person—man or woman—to hike it twice. Then, for good measure, she hiked it a third time! The photo on the cover? That’s Emma in her hiking outfit. Through the masterful pen of Ben Montgomery, Grandma Emma Gatewood comes alive on the pages of this wonderful biography of her life. Montgomery, a first rate story teller, weaves the facts of her life in a way in which keeps the narrative moving, all the while slowly revealing her life outside of her Appalachian Trail accomplishments. In the end, we really come to know and understand this amazing woman who triumphed over adversity and found deliverance in the simple act of walking. Winner. 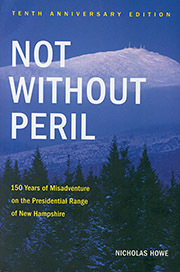 Not Without Peril: 150 Years of Misadventure on the Presidential Range of New Hampshire. By Nicholas Howe. Appalachian Mountain Club Books, Boston. ISBN 9781934028322. First published 14 years ago, Not Without Peril has quickly risen amongst the ranks of outdoor books and is clearly deserving the title of an outdoor classic. Combining painstaking historical research with his own intimate knowledge of New Hampshire’s White Mountains, Nicholas Howe recounts the struggles, deaths, and near escapes of hikers on Mount Washington. Howe gives us more than just facts of each accident, but he goes deeper, placing the accidents in the historical context of the times, including the period’s clothing and equipment, and providing a more complete understanding of the background and personalities of the people involved. Winner. (Also tied for first place in the Design & Artistic Merit category). 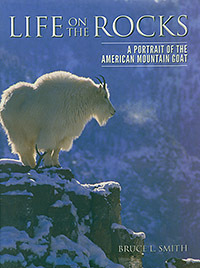 Life on the Rocks: A Portrait of the American Mountain Goat. Written and photographed by Bruce L. Smith. University Press of Colorado, Boulder, CO. ISBN 9781607322917. Life on the Rocks is not only the winner of the Nature & Environment Category, but it also tied for first place in the Design & Artistic Merit Category. This double win represents the first time in the history of the National Outdoor Books that a title entered in two categories has won both. One peek inside this large format book, and you’ll see why. You’re immediately drawn to dramatic photographs of mountain goats perched on lofty cliffsides, photographs which hint at the enormous patience that author and photographer Bruce Smith had in trying to get close to these elusive subjects. From the very first page, Smith draws us into a unique world, one that few have ever seen, the high mountains and the resplendent white goats that have adapted to life there. Smith, a wildlife biologist, writes that his desire is to help bring greater appreciation and attention to the conservation needs for this "American athlete of the Alpine." To that end, his book has accomplished those goals brilliantly. Honorable Mention. Feathers: A Beautiful Look at a Bird’s Most Unique Feature. By Stan Tekiela. Adventure Publications, Cambridge, MN. ISBN 9781591934936. 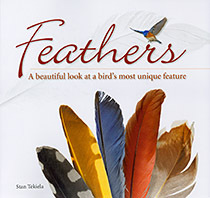 Feathers are quite possibly the most captivating of body coverings found in the animal kingdom, and Stan Tekiela in this stylishly designed book has captured them in all their colorful glory. Within the book are 230 images representing a medley of bird species. The photographs are accompanied with explanatory text, but it is the birds’ and Tekiela’s artistry that are on display here. Page through this book and you’ll never look at birds the same way. Winner. 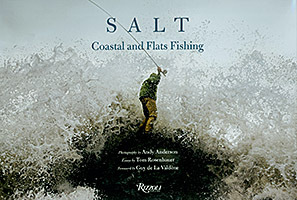 Salt: Coastal and Flats Fishing. Photographs by Andy Anderson. Essays by Tom Rosenbauer. Rizzoli International Publications, New York. ISBN 9780789327062. How best to describe this book? Dazzling. Simply dazzling. Andy Anderson, the photographer of Salt, is a consummate artist. His dramatic photography combined with an equally dazzling design has created a book that is utterly exhilarating in its depiction of the sport of coastal fishing. Anderson comes at the subject from all angles, from close-up to afar, from eye-level to point-of-view, and from under water to its misty surface. His palettes range from brilliant color to sepia tones to stark black and white. It is a masterful merging of design and photography, a true work of art. The final touch to this outstanding volume are a series of engaging essays by noted fishing author Tom Rosenbauer. Winner. 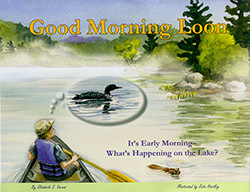 Good Morning Loon. By Elizabeth S. Varnai. Illustrated by Kate Hartley. Vista Court Books, New Hope PA. ISBN 9780962842238. What could be better! An early morning canoe trip for mom and son. Their paddle across the lake, which is told through the eyes of the boy, turns into a trip of discovery as they spot fascinating creatures: a wood frog, mergansers, beaver, osprey, great blue heron, and a twelve spotted skimmer. And finally, just before they are ready to turn back, they see a loon. “Good morning loon!” the boy cries. With each new discovery, he learns a little more about the natural world. Elizabeth Varnai’s enchanting story along with Kate Hartley’s luminous watercolors makes this a perfect bedtime read for children between the ages of 4 and 8. Winner. 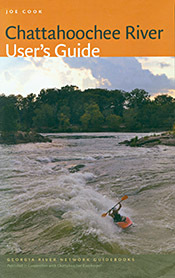 Chattahoochee River User’s Guide. By Joe Cook. University of Georgia Press, Athens, GA. ISBN 9780820346793. This guidebook which covers all 430 miles of the Chattahoochee River, has everything a good guide should have: excellent maps, enticing photographs, and intelligent organization. And the writing? That’s where this guide really shines. Researching and writing the Chattahoochee River User’s Guide was not just another job for author Joe Cook. Not at all. Rather, he was writing about something near and dear to his heart. His passion for the river is evident on nearly every page. He knows the Chattahoochee, its nooks and crannies, its history and the environmental struggles waged on the river’s behalf. The writing is so good that when you’re off the river, you may find yourself taking a peek at some portion of the book, and sometime later, lost in the writing, find yourself miles down the river from where you started. If you plan to boat, fish or just want to get to know the Chattahoochee, this is the guide to have. Winner. The Warbler Guide. By Tom Stephenson and Scott Whittle. Princeton University Press, Princeton. ISBN 9780691154824. This visually striking guide is a birders’ bonanza. 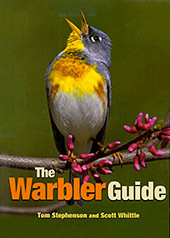 It is encyclopedic in coverage and incorporates an array of tools to help identify North America's 56 warbler species. Open it up and straight away you’ll find several handy “quick finders” which picture each bird in one of several observational aspects: face profile, side view, 45-degree perspective and underside views. That’s just a start. The bulk of the guide describes each bird in elaborate detail, including habitat keys, feeding styles, extensive sonograms, migration patterns, and photos, lots of photos, of each species seen from every possible viewing angle. Pore over this book in the winter and you’ll be armed and ready for springtime’s annual flood of warblers. Winner. 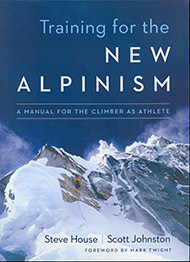 Training for the New Alpinism: A Manual for the Climber as Athlete. By Steve House and Scott Johnston. Patagonia Books, Ventura, CA. ISBN 9781938340239. In this expansive and handsomely illustrated book, accomplished climbers Steve House and Scott Johnston unveil a comprehensive training program for mountaineers. Basing their work on the latest fitness research and incorporating state-of-the-art training practices, they cover such topics as endurance and strength theory, nutrition, acclimation, work-out schedules, mental attitude and fitness assessment. Adding to the book’s readability and relevance are short vignettes written by noted mountaineers describing climbs and experiences in which training and preparation were key. Honorable Mention. Simple Fly Fishing: Techniques for Tenkara and Rod & Reel. By Yvon Chouinard, Craig Mathews and Mauro Mazzo. Paintings by James Prosek. Patagonia Books, Ventura, CA. ISBN 9781938340277. This book is about simplicity. Simplicity in fishing. It describes a form of fly fishing in which no reel is used: fishing is done only with a rod, line and fly. It’s called tenkara, a traditional form of fly fishing practiced in Japan. 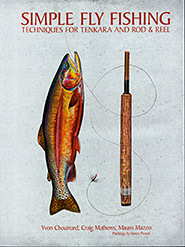 All the basics of an instructional book are there: tenkara equipment, casting techniques, knots and flies, but the real appeal of the work are the alternating comments and ruminations of the authors—short anecdotes of fishing experiences, philosophical musings, hints and suggestions for different types of fishing. Work of Significance. 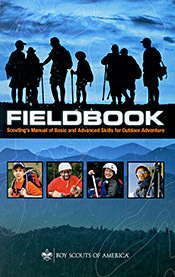 Fieldbook: Scouting's Manual of Basic and Advanced Skills for Outdoor Adventure. By Robert Birkby. Boy Scouts of America , Irving, TX. ISBN 9780839531043. The Fieldbook was first published by the Boy Scout organization in 1944 and since has gone through several revisions. With the release of its fifth edition in 2014, the judges felt it was the perfect time to recognize its influence and importance in the outdoor world. What is the Fieldbook? In short, it’s a compendium of outdoor knowledge oriented to young people. A short list of topics include planning trips, preparing menus, outdoor cooking, backcountry hygiene, navigation, leave no trace camping, first aid, survival, and observing and caring for the natural world. It also covers techniques of specific sports including backpacking, mountain travel, ski touring, snowshoeing, canoeing, kayaking, rafting and caving. It’s all contained in a perfectly sized paperback full of color photography and clear and understandable illustrations. Freelance outdoor writer/photographer/editor and certified Nordic ski instructor. Active member of the Outdoor Writers Association of America and the Northwest Outdoor Writers Association. Doctorate in Recreation and Leisure Services from University of Utah. Author of Best Easy Day Hikes Boise and Best Rail Trails Pacific Northwest: Washington, Oregon, and Idaho outdoor guidebooks and Boise's Best Outdoor Adventures mobile app travel guide. Consulting forester and founder of Redstart Forestry. Co-founder, writer and editor of Northern Woodlands Magazine (20 years). Currently active in land conservation work and all things natural. Author of The Nature of the Islands about the flora, fauna and sea life of the Caribbean. Writer, editor, and publisher. Author of several outdoor titles and a poetry collection. Independent river guide since 1968. Served as a judge for the Djerassi Resident Artists Program. Director of Literary Services for the Idaho Commission on the Arts. Doctor of Jurisprudence from the University of California. Professor of Environmental Studies at Huxley College, Western Washington University. Author of six books, most recently Wilderness in National Parks: Playground or Preserve. Former Dean of Huxley College Currently directs graduate programs at Huxley in environmental education. Teaches environmental studies, focusing on literature, history, and education.